Since United Way California Capital Region held its inaugural 2013 Day of Caring, 3,692 volunteers have spent one day caring for their community over the last five years. Volunteers donated 18,054 hours of service, valued at $366,572, for 182 projects with nonprofits, parks and schools across the region, including on United Way’s 2017 Day of Caring that took place Sept. 22-23. Hundreds of volunteers donated time for United Way’s 2017 Day of Caring at dozens of volunteer projects, including building garden beds at schools, painting nonprofit program facilities and cleaning up parks. The event began with a kickoff breakfast and rally at Cal Expo that included an appearance by Mayor Darrell Steinberg. 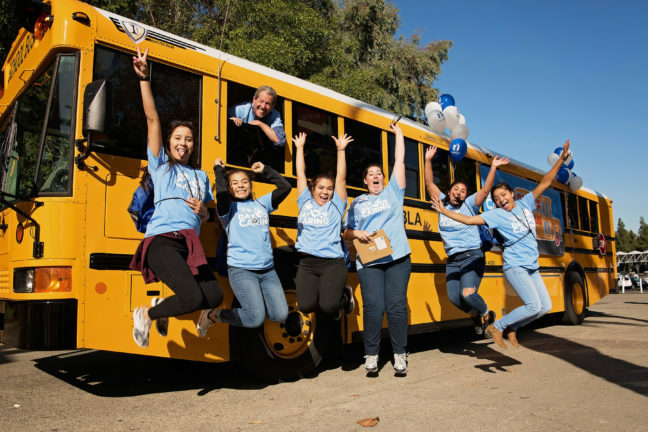 As part of this year’s Day of Caring, United Way held its inaugural Stuff the Bus campaign, which raised more than $11,000 in school supplies for Robla School District in Sacramento. Nationwide has been the presenting sponsor for Day of Caring since it began in 2013. Project sponsors for 2017 included Dr. Pepper Snapple Group, ESM Prep, KPMG, Law Offices of Deon R. Stein, Nelson Staffing, SAFE Credit Union, SMUD, Social Interest Solutions, Sutter Health, Syzmanowski Orthodontics, TaxAudit.com and Zurich. Media partners included Entercom Radio’s ESPN Radio 1320 AM, 98 Rock, Eagle 96.9 FM and 106.5 The End. Day of Caring is part of United Way California Capital Region’s Square One Project, a 20-year promise to significantly increase the number of local students who graduate from high school ready for success in college and beyond. Through nine decades of work and research across Amador, El Dorado, Sacramento, Placer and Yolo counties, United Way believes ending poverty starts in school and is working to ensure kids meet important milestones for success in college or career. To donate or volunteer: www.yourlocalunitedway.org.